They speak the Aromanian language, a Romance language closely related to Romanian. Due to the common language foundations, historians believe that the language link with Romanian was interrupted between the 7th and 9th century, after the most important features of the language were formed. 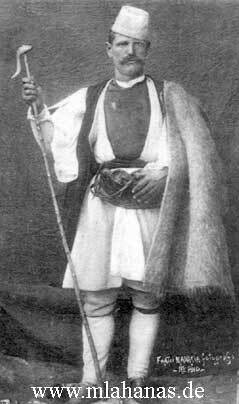 Aromanian shepherd in traditional clothes, photo from the early 1900s. The name Aromanian, just as Romanian, derives directly from Latin Romanus ("Roman") through regular sound changes. Adding "a" in front of certain words that begin with a consonant is a feature of the Aromanian language. An older form of "rumân", was still found in early 19th century, in folk songs in Greece. In Albania, the most common form is rămăńi, with occasional forms rumăńi and romăńi. Vlachs was a term used in the Medieval Balkans, as an exonym for all the Romanic people of the region, but nowadays, it is commonly used only for the Aromanians and Meglenites, the Romanians being named Vlachs only in historical context. See also: Etymology of Vlach. Another name used to refer to the Aromanians (mainly in the Slavic countries such as Serbia and Bulgaria) is "tsintsar", which is derived from the way the Aromanians say the word 'five': "tsintsi". Latinised Greeks as mercenary soldiers of the Roman legions. It is however clear that until the 7th - 9th century, Romanians and Aromanians spoke the same eastern variant of Vulgar Latin, often known as Proto-Romanian. Despite the evident Romanian linguistic connection, most Aromanians in Greece today identify as Greeks and heirs to the Byzantine tradition. It is interesting to note that Greek-speakers have also called themselves Romans (Ρωμιοί Romii) well into modern times in reference to the Greek-speaking East Roman or Byzantine Empire, which called itself Romania several centuries before the modern Balkan nation-state of the same name was conceived. It is in this context that Aromanians played an important role in the Greek War of Independence against the Ottoman Empire and generally in Greek society. Prominent Aromanians in Greece have included Ioannis Kolettis, one of the first prime ministers, Evangelos Averof, minister of Defence during the Balkan Wars and Konstantinos Krystallis, the famous poet. The pressure on Aromanians to assimilate can be traced back to the 18th century, when assimilation efforts were encouraged by the Greek missionary Kosmas Aitolos (1714-1779) who taught that Aromanians should speak Greek because as he said "it's the language of our Church" and established over 100 Greek schools in northern and western Greece. In 1941, after the Nazi occupation of Greece, some Aromanian nationalists created an autonomous Vlach state under fascist Italian control: the Principality of Pindus. However, this fascist puppet state did not survive the Second World War. The Aromanians, mostly herdsmen living in high mountain areas (especially in the Pindus area) in northern Greece never had a complete education in their language. Although Romania subsidised schools until 1948, the communist regime ended all links, and there is currently almost no education for Aromanian children in their mother tongue. The European Parliamentary Assembly examined a report on the Aromanians in 1997, and adopted a recommendation that the Greek government should do whatever is necessary to respect their culture and facilitate education in Aromanian and its use in schools, churches and the media. However, efforts to promote the Aromanian language in Greece have often been controversial amongst the Aromanians themselves, many of whom vehemently reject any idea of an officially-sanctioned distinction between them and other Greeks, often due to fear of discrimination by mainstream Greek society. On the other hand, there is a small but vocal minority within the community which strongly supports such efforts. On a visit to Metsovo, Epirus in 1998, Greek President Costis Stephanopoulos called on Aromanians to speak and teach their language, but little has been done in practical terms since then. The second largest Aromanian community lives in Albania, counting between 100,000 and 200,000 people. There are currently timid attempts to establish education in their native language in the town of Divjaka. 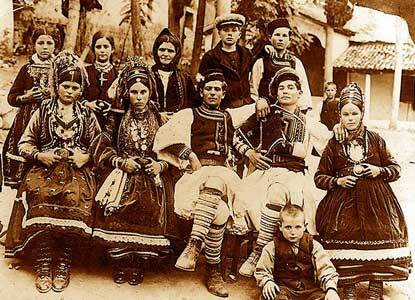 The Aromanians, under the name "Vlachs", are a recognised national minority in the Albanian constitution. For the last years there seems to be a renewal of the former policies of supporting and sponsoring of Romanian schools on the behalf of the Vlachs of Albania. As a recent article in the Romanian media points out, the kindergarten, primary and secondary schools in the Albanian town of Divjaka where the local Vlach pupils are taught classes both in Aromanian and Romanian were granted substantial help directly from the Romanian government. The only Aromanian language church in Albania, the 'Schimbarea la fata' of Korce (Curceaua) was given 2 billion lei help from the Romanian government too. According to official government figures, there are 8,467 Aromanians in the Former Yugoslav Republic of Macedonia , even though other sources estimate their numbers as high as 20,000 or even more than 100.000 according to their associations' and other estimates. The Aromanians are recognised as an ethnic minority, and are hence represented in parliament and enjoy ethnic, cultural, linguistic and religious rights and the right to education in their language. They have also received financial support from the Romanian government, which made recognition of the Former Yugoslav Republic of Macedonia's independence conditional on the extension of minority rights to the Aromanians. Since the Middle Ages, due to the Turkish occupation and the destruction of their cities, such as Moscopole, many Aromanians fled their homeland in the Balkans to settle the Romanian principalities of Wallachia and Moldavia, which had a similar language and a certain degree of autonomy from the Turks. These immigrant Aromanians were assimilated into the Romanian population. In 1860, the Romanian government opened almost 100 schools in Greece and the Ottoman territories of Macedonia and Albania in an attempt to inculcate a sense of modern Romanian national identity in a population which historically identified with the Byzantine tradition. In 1925, 47 years after Dobruja was incorporated into Romania, King Carol II of Romania gave the Aromanians land to settle in this region, which resulted in a significant migration of Aromanians into Romania. There are currently between 25,000 and 50,000 Aromanians in Romania, most of which are concentrated in Dobruja. Due to their cultural closeness to ethnic Romanians, most of them do not consider themselves to be a distinct ethnic minority but rather a "cultural minority". Recently, there has been a growing movement in Romania, both by Aromanians and by Romanian lawmakers, to recognise the Aromanians either as a separate cultural group or as a separate ethnic group, and extend to them the rights of other minorities in Romania, such as mother-tongue education and representatives in parliament.